Are you looking to add some fun entertainment for a local fete or school function? Dunking machines are the perfect way to get everyone involved in the event – who doesn’t want to take the opportunity to dunk their friends, teachers or even their bosses? When it comes to dunkers, look no further than our range of dunking machines for hire in Melbourne. The equipment is easy to set up as it only needs to be filled with water, which takes approximately one hour, and doesn’t need any power source to operate. It comes with its own trailer for easy pick up and is an affordable solution that will provide countless laughs and splashes. Are you interested in our dunkers? Contact our friendly team for more information. Dunking Machines, Jumping Castles and More! At Smart Amusements, we’re proud to be Melbourne’s leading provider of amusement rides, carnival games and food equipment. 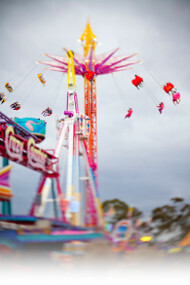 Whether you’re looking to hire our Chair-o-Planes, Cha-Cha Rides, Slides, Dodgem Cars or Jumping Castles, you can rest assured that each and every ride is covered by Public Liability Insurance and are also regularly checked by a qualified engineer and electrician, as well as being regularly audited by Worksafe Victoria representatives. With our massive range, high quality amusements and unbeatable customer service, it’s easy to see why more Victorians are choosing Smart Amusements to bring the fun for their next event. With our huge range of amusements available for hire, your upcoming school fete or carnival is sure to be the most exciting on the calendar. If you’re interested in any of our amusement rides, games or food equipment available for hire, or if you have any questions about our services then please get in touch! Give us a call on (03) 9555 6606, or contact us using our online contact form, and one of our friendly and knowledgeable team will get back to you as soon as possible. Takes 1000 Ltrs Water and approx. 1 hour to fill. Dunking machine hire for Melbourne events! Are you looking for some fun entertainment for a local fete or school function? 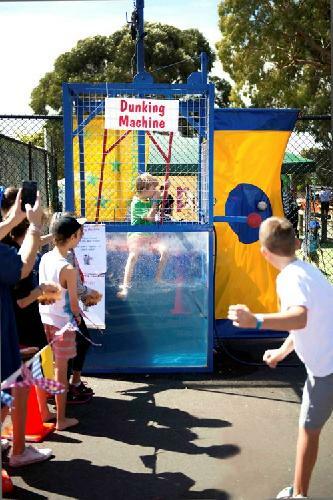 Our dunking machine hire in Melbourne offers hours of fun as people try to dunk teachers, bosses or friends. This equipment is easy to set up as it only needs to be filled with water, which takes approximately one hour, and doesn’t need any power source to operate. It comes with its own trailer for easy pick up and is an affordable solution that will provide countless laughs and splashes. To find out more about our dunker, please get in touch with our helpful team.